Tell us a little about College Prep and why you decided to start blogging. I had a rough first semester at college. Really, really rough. One night, right before final exams, my friends and I were sitting in our common room and I was complaining about how I would never need to know accounting. My friend suggested that I start a blog. I laughed, brushed it off, and kept studying. But over break, I decided to set up an account just to tell my friend I started one. Now, more than two years later, here I am! College Prep may have started as a joke, but it has grown into an identity in and of itself. College Prep delves into college life: organization tips, study tips, lifestyle, fashion and tidbits of random fun! College is really stressful and I use College Prep as an escape. I hope it provides a little escape for readers too! Everywhere! I love flipping through magazines, both a guilty pleasure and a luxury for a busy college student, as well as fashion blogs, television shows, "looks we love" on retail websites, and even more so, my peers. I am always in awe when I see students pulling off the coolest looks. I take what I see from all around, pull the pieces that I like and sort of blend it together with my personal taste to come up with my daily style. Why did you decide to write Freshman 50 and how did it go? As I mentioned before, I struggled through my first semester. Trust me, it was bad. Failed midterms, hospitalization and an identity crisis were all involved. Right after my dean convinced me to not drop out of college, I started compiling a list. (I'm really into lists.) The list was everything and anything I wish I had known before coming to Georgetown. By February, the list had grown to 27 items. I realized this was something I could turn into a book. 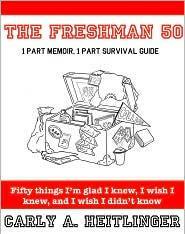 I have found, since publishing The Freshman 50, that many students struggled in one way or another during freshman year. However, no one really talks about it. College is supposed to be "the best time" of our lives. We're not supposed to struggle, we're not supposed to be depressed and we're certainly not supposed to fail. The Freshman 50 is partly a memoir, but more importantly a survival guide. It's the encouragement you need to get through all the tough times! What does "prepster" mean to you? How do you balance blogging and college? This is a challenge I face every day. I have to manage my time very well. I consider myself to be a student athlete blogger. Obviously, I am a student first. Then an athlete: I'm a coxswain on the men's heavyweight rowing team. Finally, I am a blogger. I make blogging a priority and sometimes have to make trade-offs to get it down. For example, I sometimes have to forego outings with friends. I work really hard academically and spend a lot of my time down at the boathouse or on the water with my team. But I also spend a lot of time writing posts, answering emails, finding inspirations, maintaining my various micro-blogs, etc. There are late nights, stressful days and numerous meltdowns (whoops! ), but at the end of the day, what keeps me going is that I love blogging. I could never handle school, crew and blogging if I didn't love it!